Carefully remove the tiles from their frame before the first game. Place them in the bag and mix them thoroughly. The area on the table in front of each player is his play area (described below). This is where he places his suns and the tiles he acquires. Also, carefully remove the VP tokens from their frame before the first game. The players take two value 5 tablets each and place them face down in their play areas. Place the remaining tablets face up beside the game board. Sort the Suns - showing values 2 - 9 with two players, 2 - 13 with three or four players and 2 - 16 with five players into groups as shown below and place the groups face down on the table. The players decide randomly which player receives which group. The players place their suns face up in their play areas. Place the sun numbered 1 face up on the sun space in the center of the game board. Place the Ra figure next to the game board. The player with the highest numbered sun begins. After his turn, play continues around the table in the clockwise direction. A player without suns takes no actions on his turn. 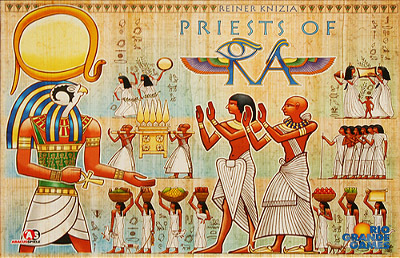 When the auction track is full, players are limited to playing God tiles or invoking Ra. 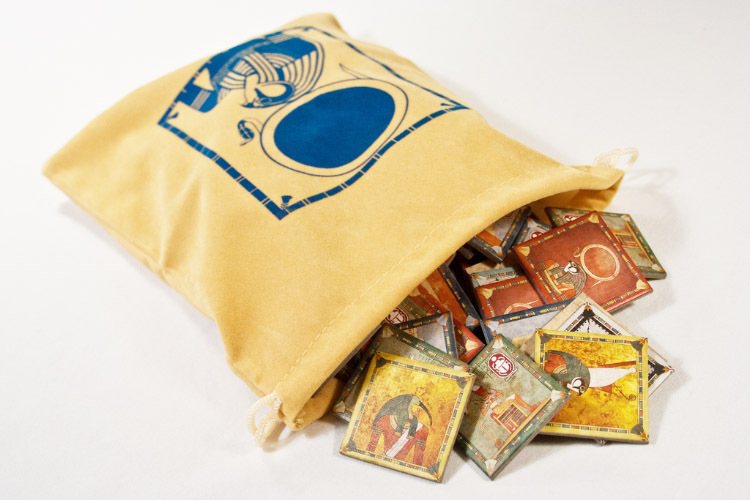 On a player's turn, he draws one tile from the bag and looks at it, showing it to all players. When the tile drawn is a Ra tile, he places it on the next empty space on the Ra track and places the Ra figure in his play area (the area before him on the table). This begins an auction (see below). When a player turns over any other tile, he places it on the next empty space on the auction track, ending his turn. The player always places the tile drawn on the track in the next empty space on that track starting from the left. Note: when playing with less than 5 players, the first 4 (2 players), 2 (3 players), and 1 (4 players) space(s) on the Ra track are not used. If a player has one or more God tiles in his play area, he may play one or more of them to take one tile for each played from the auction track. He returns any God tile played face-down to the box and places the tile taken from the auction track in his play area. A player may not take a God tile from the auction track or a Ra tile from the Ra track. When gaps in the auction track result from this action, players fill these with tiles drawn and placed on the track in later turns. The player says, "Ra", and places the Ra figure in his play area. This begins an auction (see below). 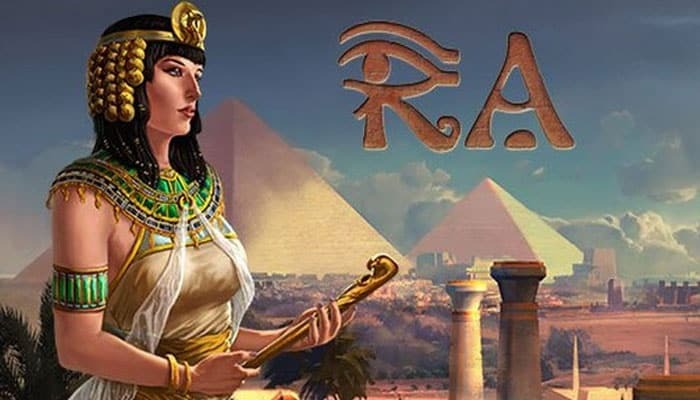 The player whose action caused the auction by turning over a Ra tile or invoking Ra is the Ra player for this auction. He places the Ra figure in his play area to indicate this. The auction begins with the player to the left of the Ra player and continues clockwise once around the table, ending with the Ra player. The players are bidding for the tiles in the auction track. The winner also takes the sun in the sun space on the board. If there are no tiles in the auction track, the winner gets only the sun. Each player, in turn, may bid one of their face up suns by placing it on the edge of the board. Bids subsequent to the first must be greater than the previous bid. A player may pass, choosing not to bid. However, for an auction held when a player voluntarily invokes Ra, the Ra player must bid if all other players pass. When a player involuntarily invokes Ra because the auction track is full and he does not choose to play a God tile, he may pass even if all others pass. In this case, all tiles on the auction track are returned face down to the box. When an auction is held due to a Ra tile being turned over, all players may pass, including the Ra player, and the tiles on the auction track remain. The player with the highest bid, takes all tiles on the auction track (if there are any) and places them face up in his play area. Use the example on the next page when placing the tiles in your play area as this will make scoring easier later in the game. He also takes the sun from the center of the board and places it face down in his play area. Face down suns cannot be used for the remainder of this epoch, but will be turned face up at the beginning of the next epoch. The player then places the sun he bid face up on the sun space in the middle of the board. Remember, if all eight auction tile spaces have tiles on them, a player may not draw and place a tile. He may only play God tiles (if he has them) or invoke Ra. If he chooses to invoke Ra in this case, he does not need to bid if no other player does. Invoke "Ra": the player who invoked Ra must bid one of his suns, if all other players pass. However, if at least one other player bids, the player who invoked Ra may bid or pass as he chooses. Of course, all other players may pass if they choose. Draw and place Ra tile: in this case all players, including the Ra player, may pass and the auction tiles remain on the board. When the auction track is full and the player chooses to invoke Ra, all players, including the Ra player, may pass. In this case, the tiles on the auction track are removed and returned face down to the box. When the Ra track is complete, there is no auction. In this case, the tiles on the auction track and the Ra tiles on the Ra track are removed and returned face down to the box. After the auction is complete, the player to the left of the Ra player continues the game by taking a normal turn. As a player with no face up suns in his play area (i.e. he has used all his suns) may take no more turns in the epoch, there are decreasingly fewer players to compete for the tiles. When the last player with face up suns uses his last sun and completes his turn, the epoch ends. All tiles on the Ra track are returned face-down to the box; the sun in the middle of the board remains for the next epoch. The epoch also ends immediately, when the Ra track is full. In this case, there is no auction ! and all tiles are removed from both the Ra track and the auction track and returned face-down to the box. Only the face up sun remains on the game board. Unused face up suns in a player's play area remain face up for the next epoch. When a player wins an auction and one or more disaster tiles are included in the tiles a player takes from the auction track, he may lose other tiles from his play area. First, he places all other tiles taken in the auction into his play area. Then, he must "fulfill" the disasters by discarding two tiles from the category that matches the disaster. If the player has just a single tile of the indicated category, he loses only this single tile. If he has no tiles of the indicated category, he loses no tiles due to that disaster. A player must fulfill all disasters he takes. A player may choose which tiles of the indicated category to discard, except for drought. With drought, the player must first discard flood tiles (up to 2 per drought) if he has any and then Nile tiles to bring the total to 2 per drought. The chosen tiles are returned face-down to the box along with the disaster tiles. At the end of an epoch, the tiles in the players' play areas are scored (see below). After scoring, all face down suns are turned face up. The players will begin each epoch with the same number of suns. However, the players will have different valued suns than they did at the beginning of the game. The player with the highest numbered sun begins the next epoch. At the end of each of the three epochs, the players receive fame for their efforts in the form of tablets. After a player's total fame has been calculated, he receives (or loses) tablets equal to the total. The players keep their tablets face down in their play areas. Each God tile in the play area earns 2 points of fame for the player and is returned face down to the box. 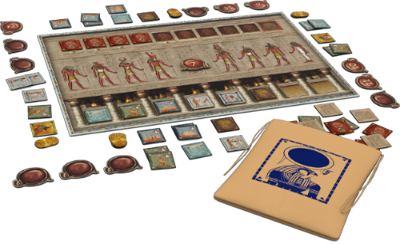 After each epoch, the player with the most Pharaoh tiles receives 5 points of fame and the player with the fewest loses 2 points. If two or more players tie for most or fewest, each gains the 5 points or loses the 2 points. If all players have the same number of Pharaoh tiles, no points are awarded or lost. The Pharaoh tiles remain in the players' play areas for the next epoch. Example: The players Anna, Bob, Cathy, and Don have 3 - 2 - 2 - 3 Pharaohs. Anna and Don earn 5 fame points each; Bob and Cathy each lose 2 points. 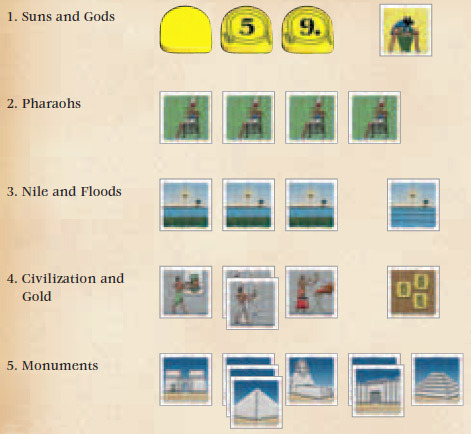 After each epoch, each player receives one fame point for each flood and Nile tile in his play area. However, he only receives these points if he has at least one flood tile. Players without flood tiles do not score points for their Nile tiles. After scoring, all flood tiles are returned face down to the box. The Nile tiles, however, remain in the players' play areas for the next epoch. After each epoch, players with no civilization tiles in their play areas lose 5 fame points. 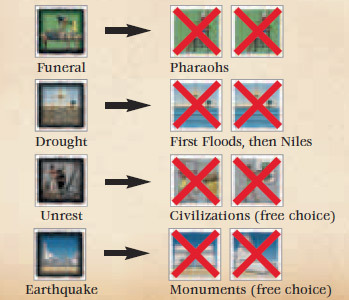 If a player has three different civilization tiles, he earns 5 fame points, for four different tiles he earns 10 points and for all five different tiles he earns 15 points. After scoring, all civilization tiles are returned face down to the box. Example: Anna has 3 astronomy, 2 agriculture and 2 writing tiles. She receives 5 points, since she has three different civilization tiles. For one each of astronomy, agriculture and writing she would have received the same. Extra tiles of the same civilization tile do not earn extra points. After each epoch, each player receives 3 fame points for each gold tile in his play area. After scoring, the gold tiles are returned face down to the box. Monuments are scored only after the third epoch. They remain in the players' play areas throughout the game. Players receive 1 fame point for each different monument for up to 6 different monuments, 10 points for having 7 different monuments, and 15 points for having all 8 different monuments. In addition, a player receives a bonus of 5 points for each group of three identical monuments, 10 points for each group of four, and 15 points for each group of five. Example: Anna has 4 pyramids, 3 temples, 2 fortresses and 1 sphinx. After the third epoch she receives 19 points (4 for four different monuments, 10 for four pyramids and 5 for three temples). Thus, she receives points for all her monuments except the second fortress. Like monuments, the suns are scored only after the third epoch. Each player sums the numbers on all his suns (both face up and face down). The player with the highest total receives 5 fame points and the player with lowest total loses 5 fame points. If two or more players tie for most or fewest, each gains or loses 5 points each. If all players have the same total, no points are awarded or lost. Example: The players Anna, Bob, Cathy, and Don sum their suns and calculate their sums as: 17 - 25 - 21 - 17. Bob receives 5 points and Anna and Don each lose 5 points. Cathy neither gains nor loses points. When the scoring after the third epoch is complete, the game ends. Each player adds all points of fame on his tablets. The player with the highest result wins. If two or more players tie with the highest total, the player, among those tied for highest total, with the highest numbered sun is the winner.